Practical and down-to-earth, the second edition of Action Research in Teaching and Learning is an ideal introduction to the subject, offering a distinctive blend of the theoretical and the practical, grounded firmly in the global higher education landscape. Written in an accessible style to build confidence, it provides easily adaptable, practical frameworks, guidelines and advice on research practice within a higher education context. The reader is guided through each stage of the action research process, from engaging with the critical theory, to the practical applications with the ultimate goal of providing a research study which is publishable. Supplemented by useful pedagogical research tools and exemplars of both qualitative and quantitative action research studies, this new edition features chapters engaging with teaching excellence and analysing qualitative and quantitative research, additions to the resources section and a new preface focusing more explicitly on the ever-growing number of part-time academics. 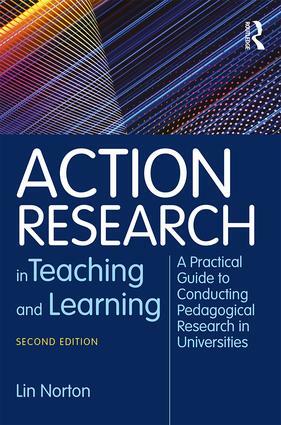 Action Research in Teaching and Learning combines a theoretical understanding of the scholarly literature with practical applications and is an essential, critical read for any individual teaching or undertaking action research. What does doing pedagogical action research mean in the current higher education context? Why is the professionalization of university teaching important? How can pedagogical action research contribute to career development? Where do you start a pedagogical action research study? What research methods should you choose? How can you analyze qualitative data in pedagogical action research? How can you analyze quantitative data in pedagogical action research? How can you use pedagogical tools for your action research study? What are the ethical issues involved in pedagogical action research? How can you grow the influence of your findings?